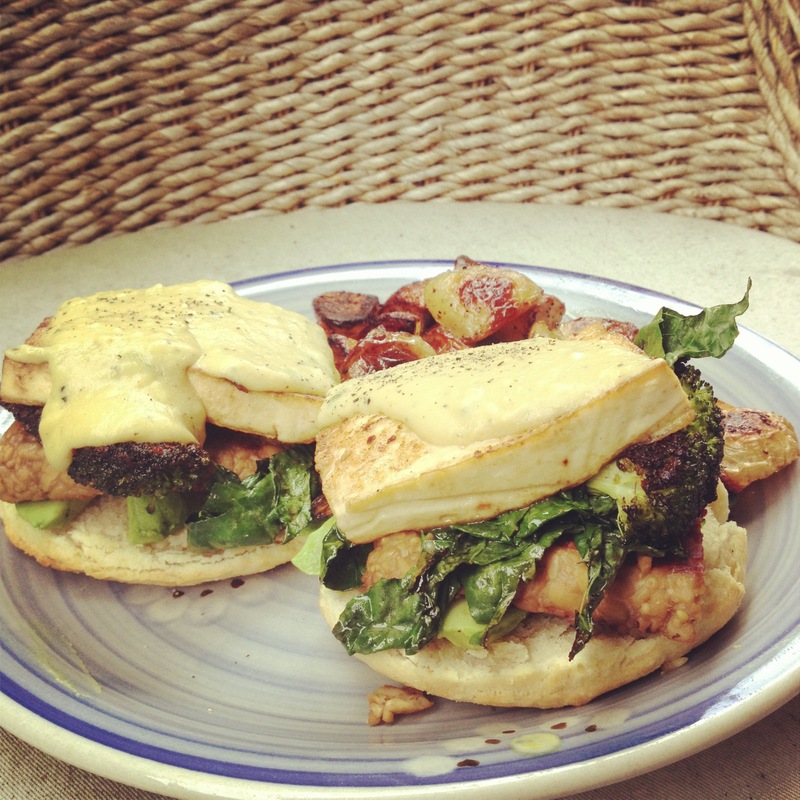 tofu benedict! delicious and insanely huge. this was a celebratory brunch because a- it was nice out and b- my boyfriend didn’t float away in the flood in Calgary. i used this biscuit recipe without the chives and cheese BUT HEY you could leave em in too. i cut them out big, about 4 inch circles, so cooking time is about 5 minutes longer. you’ll have extra biscuits. 4 slices of broccoli, cut so the stalk is still attached and you have nice intact slices. for the tempeh, i used this marinade for about 10 minutes then fried it up in a skillet until brown on both sides. remove and put aside. roast the broccoli with a bit of oil at 400 on a baking sheet for 10-15 minutes, flip once. in the same a skillet real hot with olive oil then add the tofu unti browned. flip, add kale to the pan with garlic. dust tofu with nutritional yeast, garlic powder and black pepper. once the other side is browned, you’re done! the kale just needs to wilt a bit and slightly saute the garlic. Cut a biscuit in half, add 1/4 avocado per side, a slice of tempeh, a slice of broccoli, a quarter of the kale and a slab of tofu. do this to the other three then top with hollandaise. eat! melt earth balance in a pot, add flour and whisk. once thickened, slowly add almond milk, whisking as it thickens. add everything else, taste and adjust to your taste. if it’s too thick add a bit of almond milk to thin. all done! Awesome! Thanks for the post and the recipe. I can’t wait to try it!